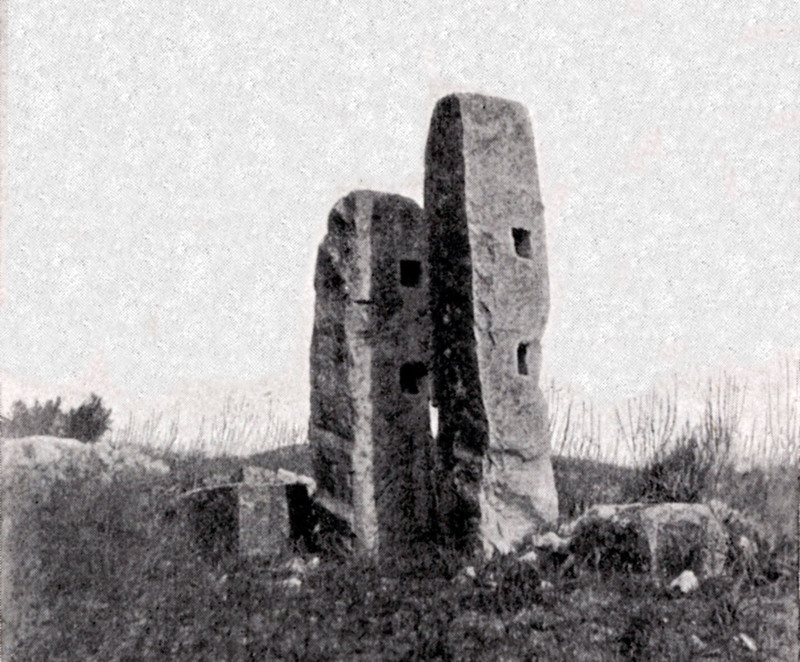 Libyan stone remains of unknown date, though undoubtedly pre-Roman, known as Senam Bu-Samida in Ghirrah. 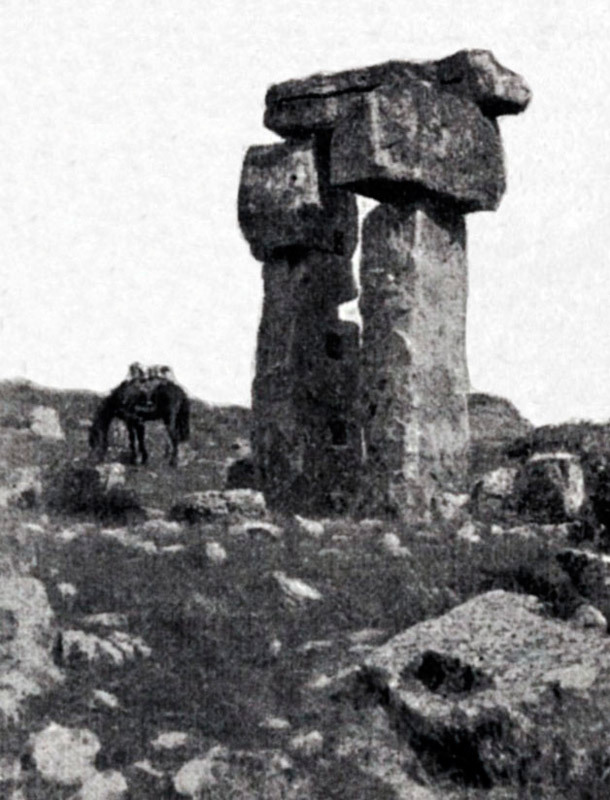 Figure 31 on page 138 from H. S. Cowper, The Hill of Graces: A Record of Investigation among the Trilithons and Megalithic Sites of Tripoli, London, 1897. 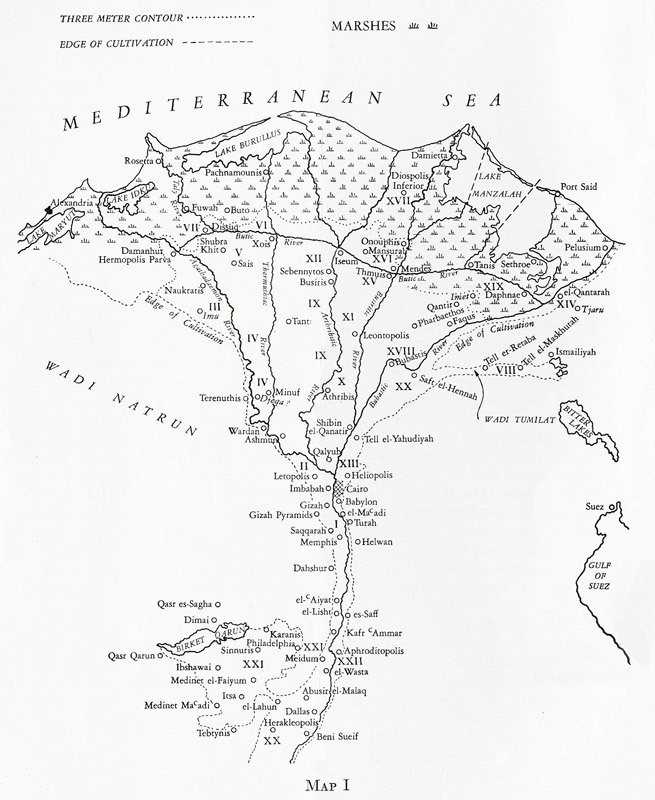 Libyan trilithon known as the Senam near Kasr Doga. Figure 70 on page 239 from H. S. Cowper, The Hill of Graces: A Record of Investigation among the Trilithons and Megalithic Sites of Tripoli, London, 1897. 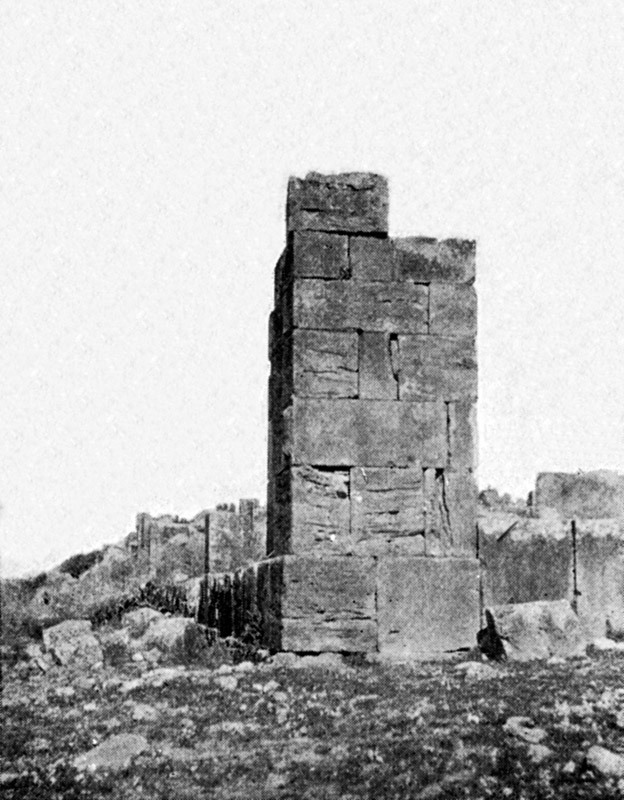 Libyan masonry remains known as Senam Kasr Fasgha. A finely-built narrow trilithon appears here to have been surmounted by inferior masonry of a later date and incorporated in a different kind of structure by some other culture. 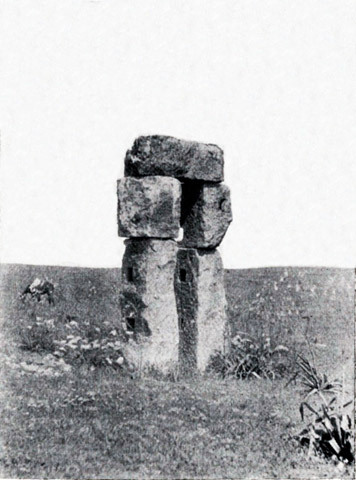 Figure 44 on page 158 from H. S. Cowper, The Hill of Graces: A Record of Investigation among the Trilithons and Megalithic Sites of Tripoli, London, 1897. 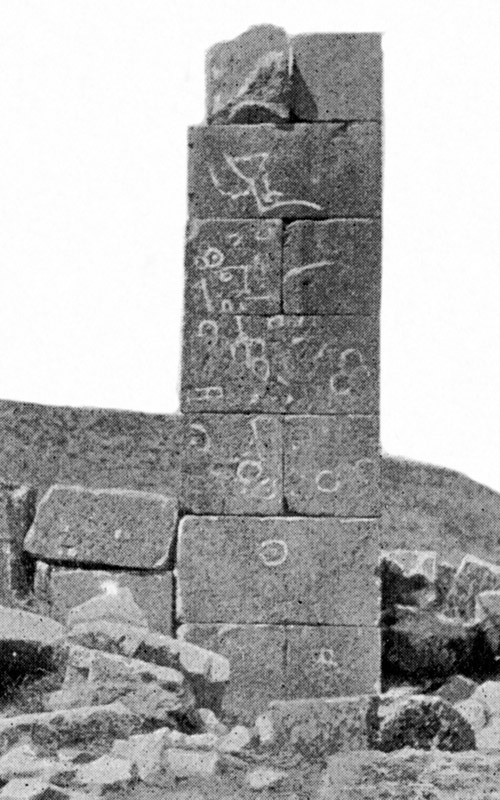 Pre-Roman masonry at Senam Aref covered in bizarre graffiti. 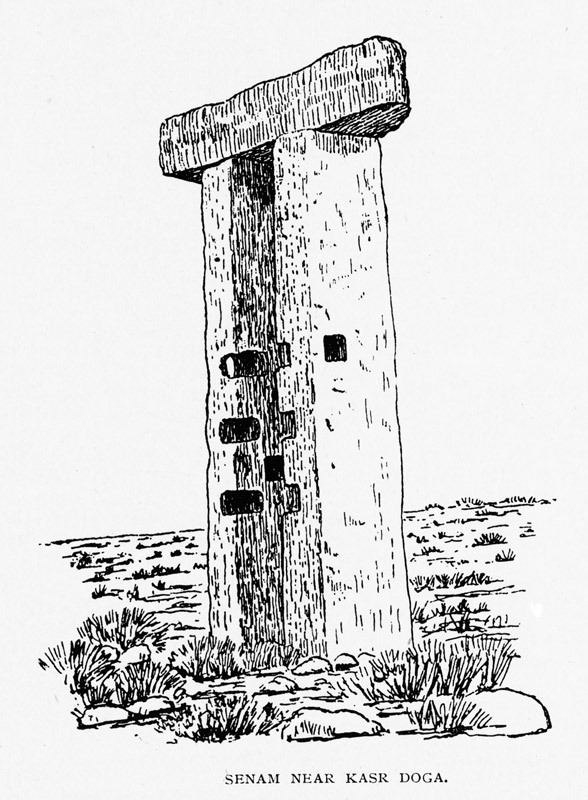 Figure 45 on page 159 from H. S. Cowper, The Hill of Graces: A Record of Investigation among the Trilithons and Megalithic Sites of Tripoli, London, 1897. 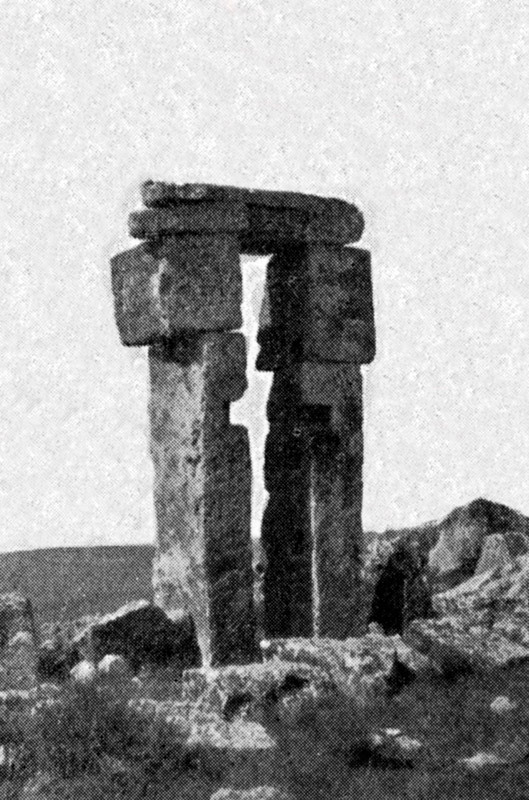 Strange Libyan trilithon with several layers including a balancing stone on top, known as the Senam at Henshir el-Mohammed. 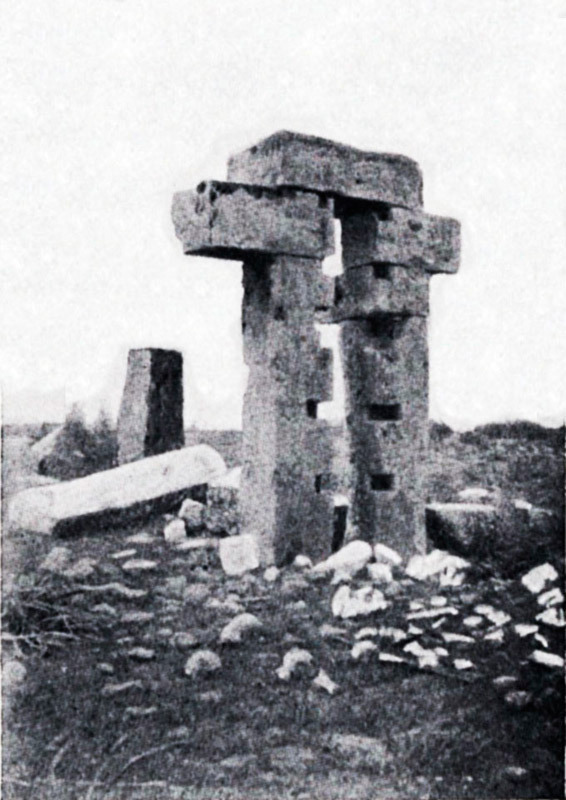 Figure 51 on page 174 from H. S. Cowper, The Hill of Graces: A Record of Investigation among the Trilithons and Megalithic Sites of Tripoli, London, 1897. 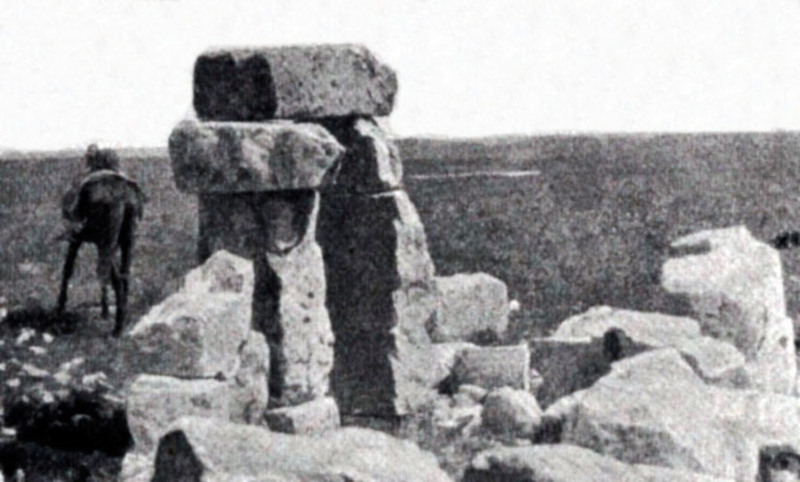 Libyan trilithon known as Senam Terr-gurt, surrounded by collapsed masonry and stones. Figure 52 on page 176 from H. S. Cowper, The Hill of Graces: A Record of Investigation among the Trilithons and Megalithic Sites of Tripoli, London, 1897. 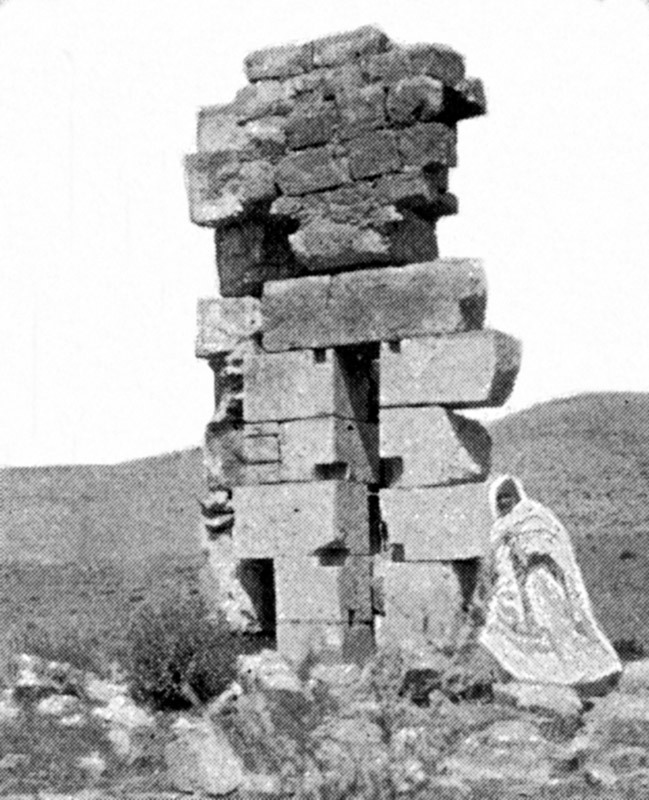 A Libyan trilithon (seen at an angle) known as Senam el-Nejm, beside which stands the tall remains of further masonry of unknown purpose, and much other fallen masonry nearby. Figure 55 on page 191 from H. S. Cowper, The Hill of Graces: A Record of Investigation among the Trilithons and Megalithic Sites of Tripoli, London, 1897. 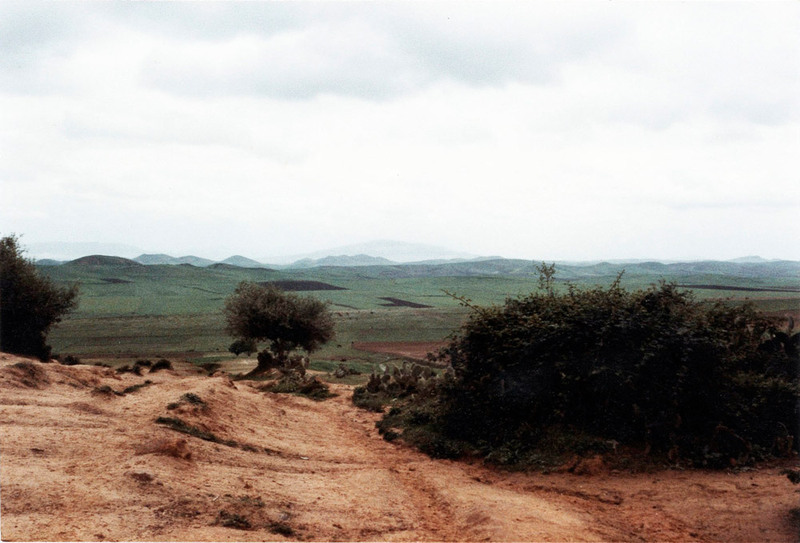 Senam el-Jereh, twenty minutes’ ride in a north-easterly direction from Kom Nasr. 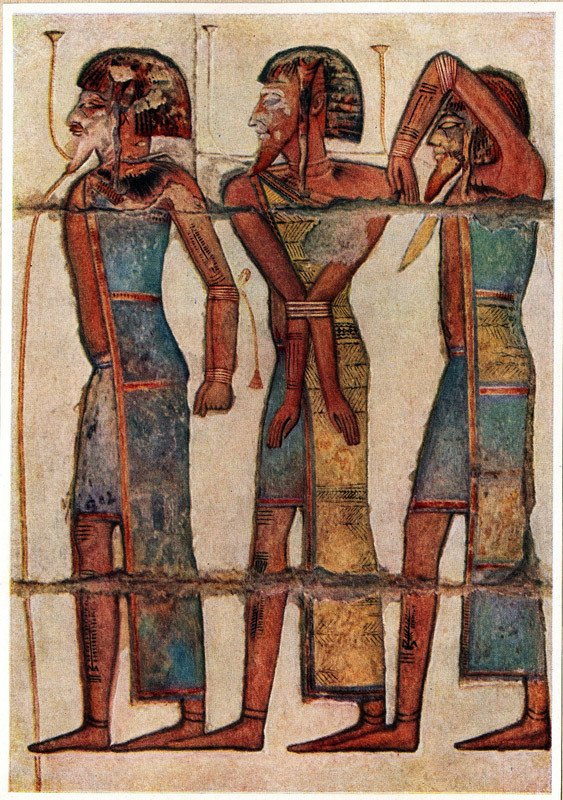 The left-hnd jamb is 6 feet 5 inches high, and the right-hand one is 6 feet high. 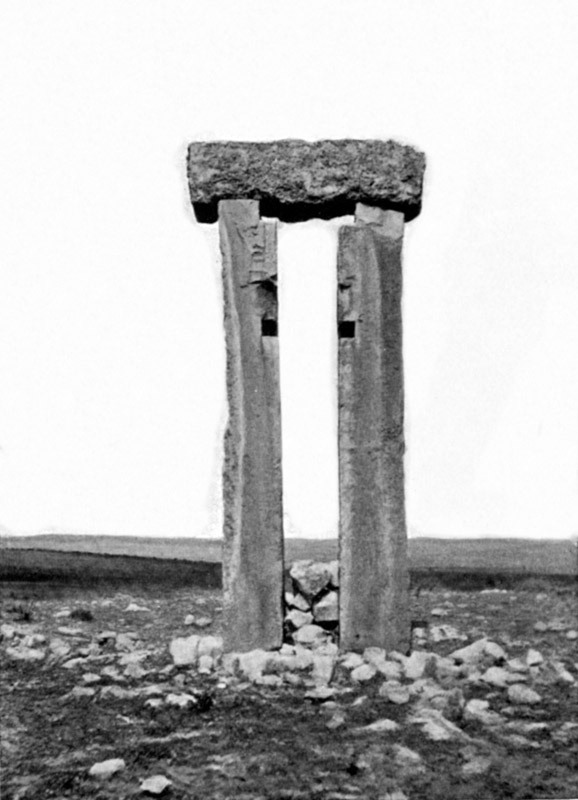 The total height of the senam is nearly 11 feet. 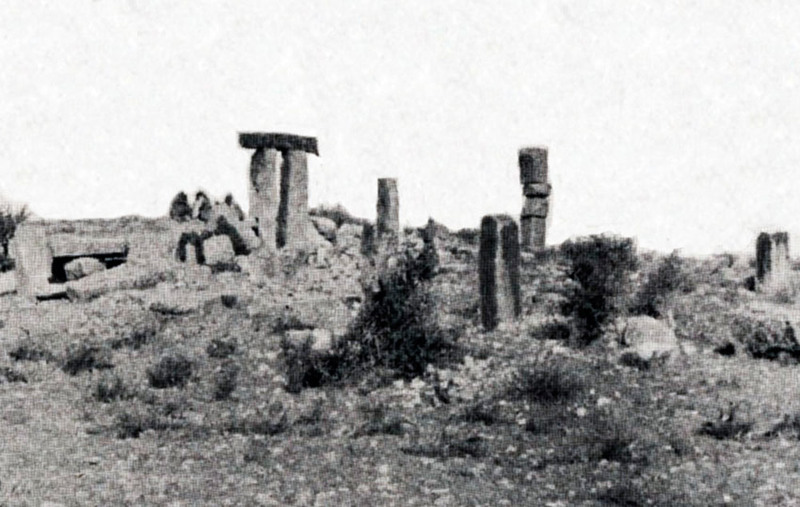 Figure 77, page 254, from H. S. Cowper, The Hill of the Graces: A Record of Investigation among the Trilithons and Megalithic Sites of Tripoli, London, 1897. 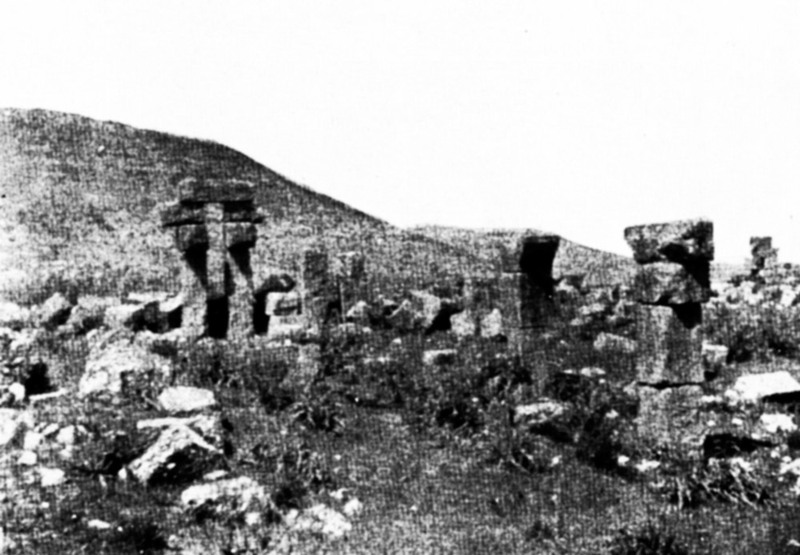 Senam Ferjana, Number 1, at Kas Zuguesh or Kasr Ferjana in th Ferjana District of Tarhuna. 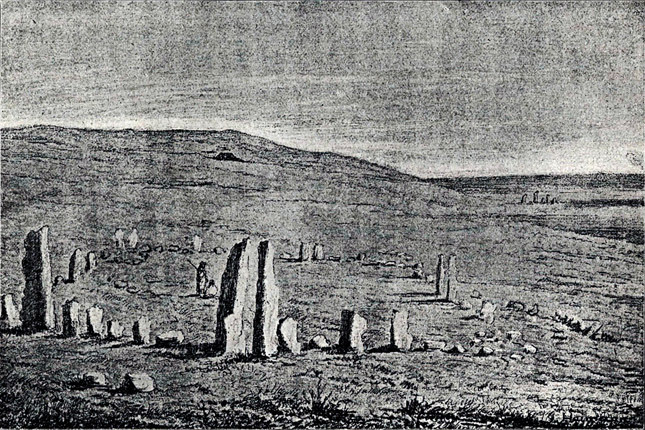 Figure 80, page 260, from H. S. Cowper, The Hill of the Graces: A Record of Investigation among the Trilithons and Megalithic Sites of Tripoli, London, 1897. 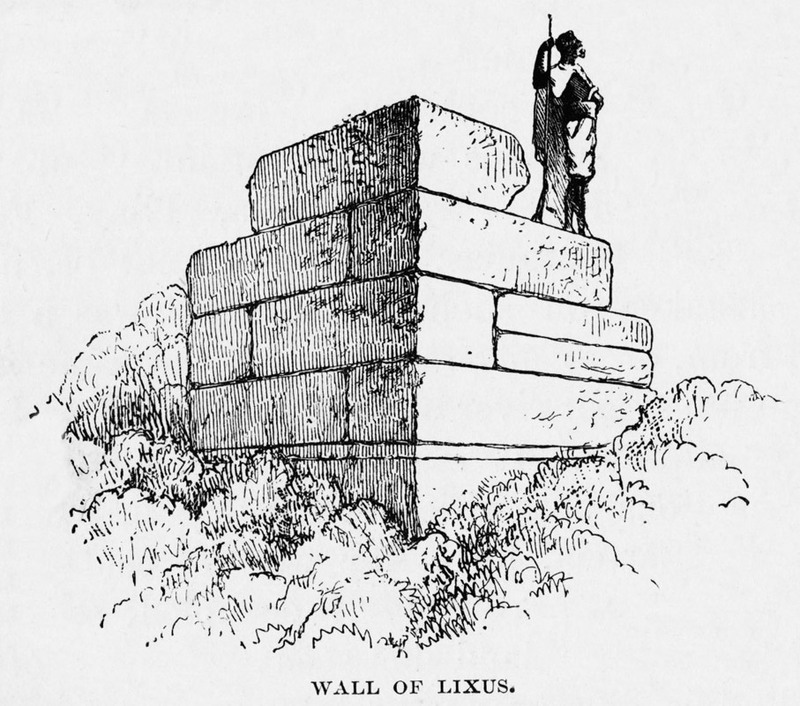 This drawing showing a portion of a surviving pre-Roman wall at Lixus on the Atlantic coast of Morocco is from p. 123 of George Rawlinson, A History of Phoenicia, London, 1889. Rawlinson assumed this wall, which he personally inspected, to be at least Phoenician, though it could date from an earlier period, and is certainly from long before the Roman occupation of Lixus. He described it as follows: ‘The blocks are squared, carefully dressed, and arranged in horizontal courses, without any cement. 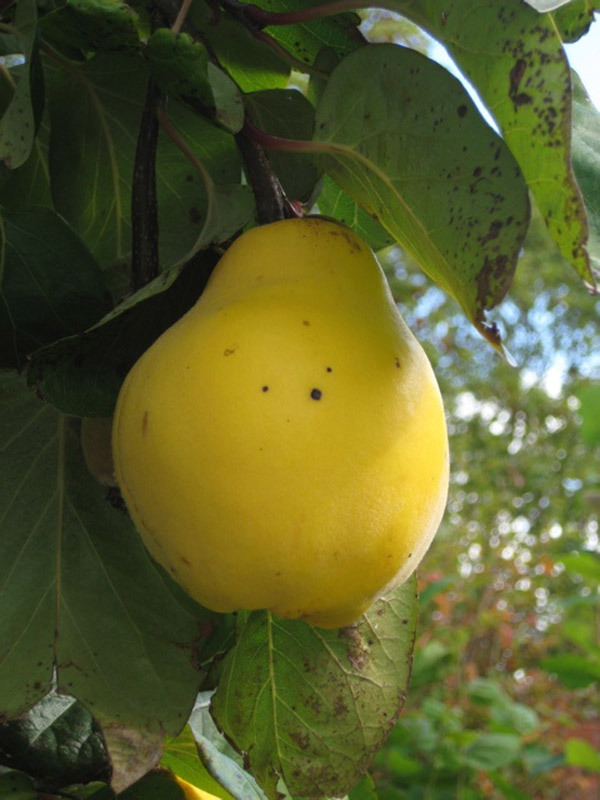 Some of them are as much as eleven feet long by six feet or somewhat more in height. The wall was flanked at the corner by square towers, and formed a sort of irregular hexagon, above a mile in circumference. 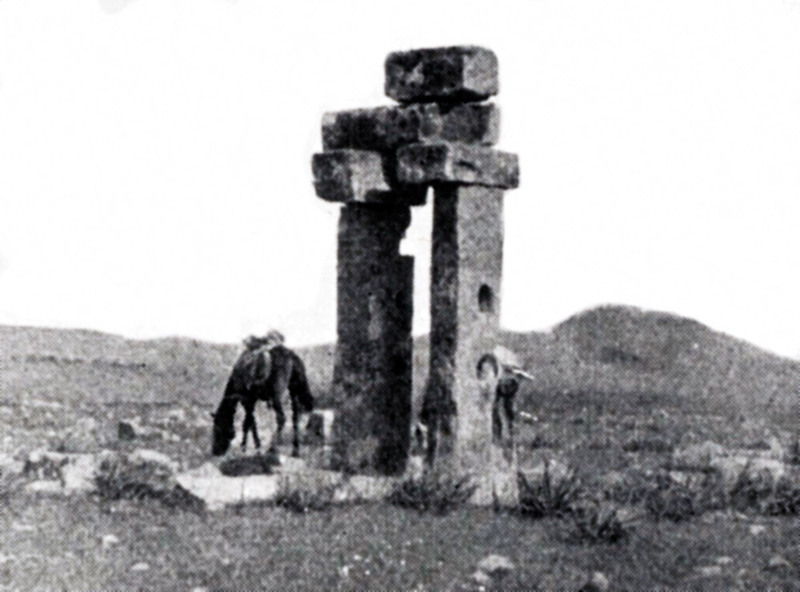 A large building within the walls seems to have been a temple; and in it was found one of those remarkable conical stones which are known to have been employed in the Phoenician worship. 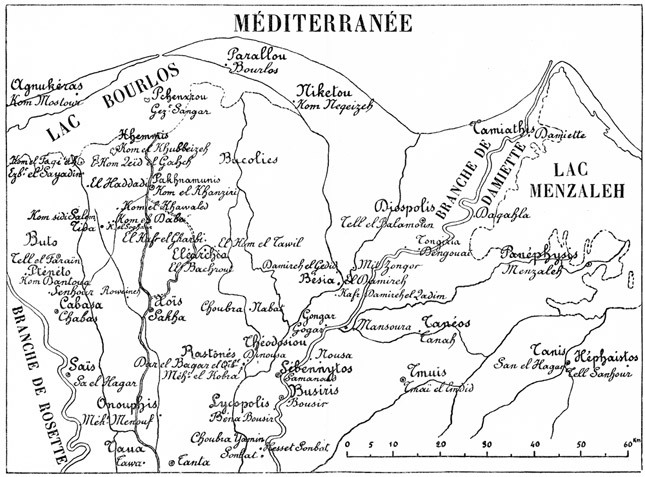 The estuary of the river formed a tolerably safe harbour for the Phoenician ships, and the valley down which the river flows gave a ready access into the interior.’ It is certainly possible that all or part of this wall of more than a mile in length, perhaps this very portion, dates from the pre-Phoenician occupation of Lixus. 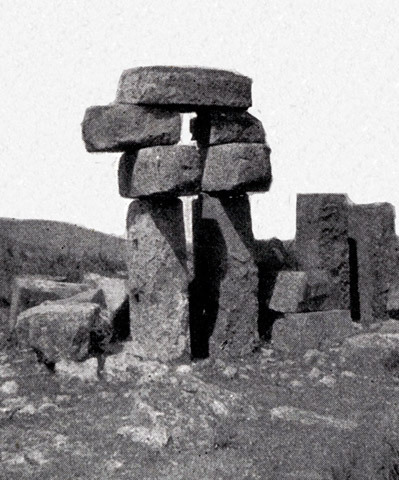 Megalithic remains of a much earlier era must have been recycled by the Phoenicians at Lixus subsequent to 1550 BC, if only because the utility of the stones was obvious. 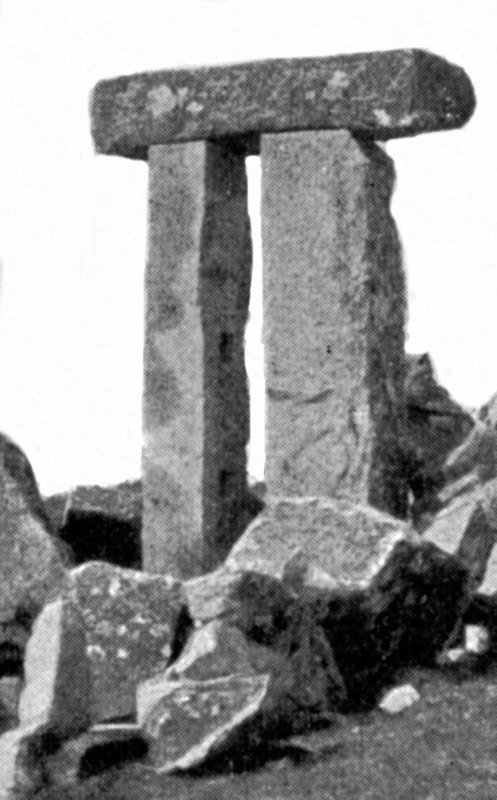 Until a much more careful archaeological study of the pre-Roman remains at Lixus is undertaken, it is impossible to differentiate what is wholly Phoenician from what is earlier, or what is a combination of the two, with earlier stones being recycled or built upon as foundations by Phoenician structures. 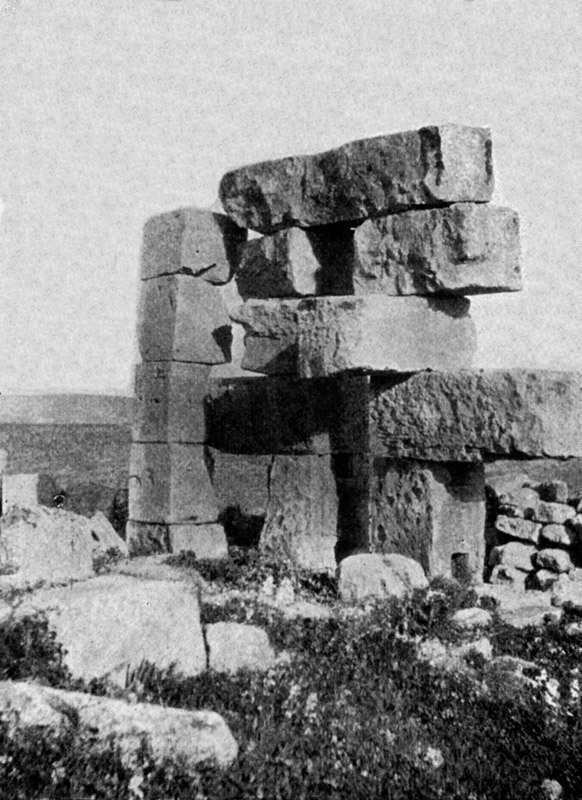 Certainly these large blocks, which are presumed to be of limestone (Rawlinson does not identify the stone), are equivalent in size and shaping to many Old Kingdom Egyptian limestone blocks. 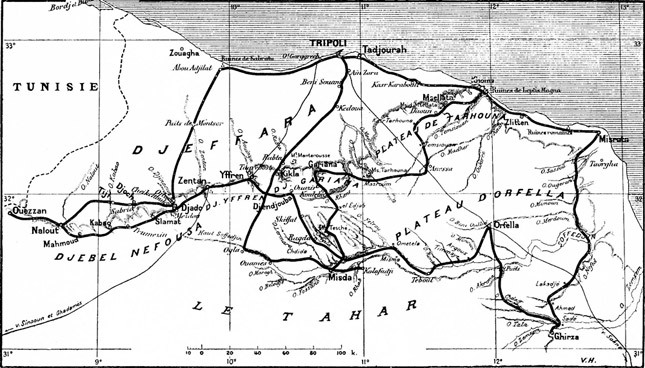 Rawlinson’s comments about the harbour and the inland access up river are highly relevant to what we now know about the megalithic ring at Mezorah, the existence of which was unknown to Rawlinson. A megalithic ring in Cyrenaica in Libya, from Giuseppe Haimann, Cirenaica, 1882. FIGURE 8-1(sup). 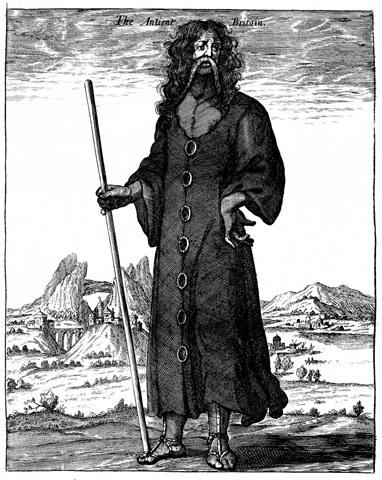 This engraving was done by W. Dolle in 1676 to portray the ‘ancient Briton’ in his long black cloak down to his ankles and holding a staff, as described by Strabo in the first century AD, in the passage which is quoted in the main text of the book, Chapter 8. This appeared in the quaint and fascinating folio volume Britannia Antiqua Illustrata: or, The Antiquities of Ancient Britain by Aylett Sammes, London, 1676, p. 117. FIGURE 8-2(sup). 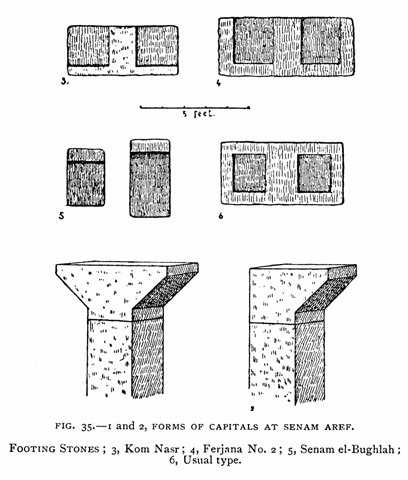 Drawings by Cowper giving details of the masonry remains at Senam Aref (see Plate X for the trilithon there). Figure 35 on page 143 from H. S. Cowper, The Hill of Graces: A Record of Investigation among the Trilithons and Megalithic Sites of Tripoli, London, 1897. 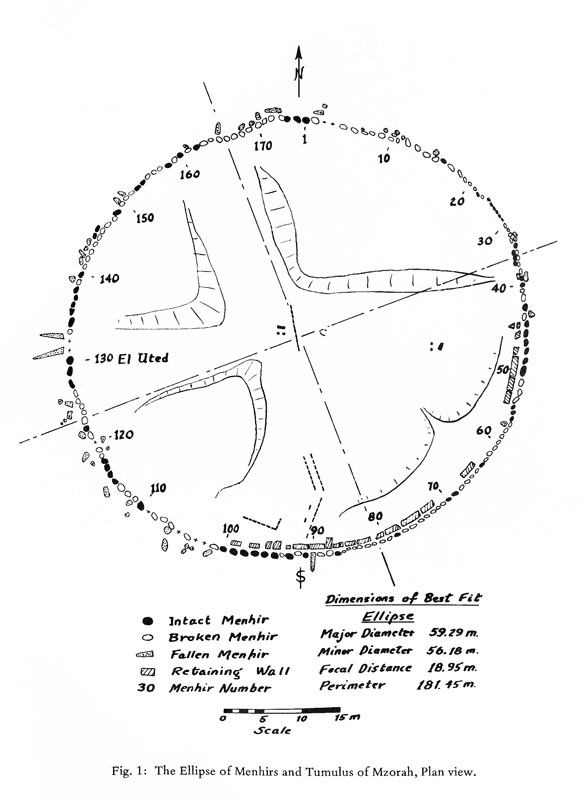 FIGURE 8-3(sup). plan of the square mound which contains the senam in its southern corner (shown in plan at right). Figures 64-65, from page 226 of H. S. Cowper, The Hill of the Graces: A Record of Investigation among the Trilithons and Megalithic Sites of Tripoli, London, 1897. FIGURE 8-4(sup). 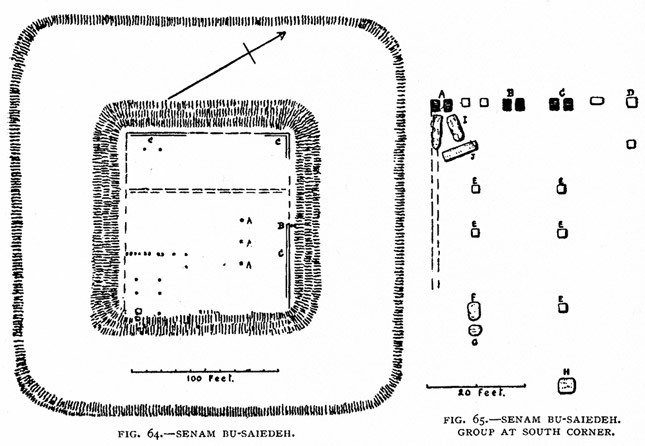 plan of the square mound which contains the senam in its southern corner (shown in plan at right). 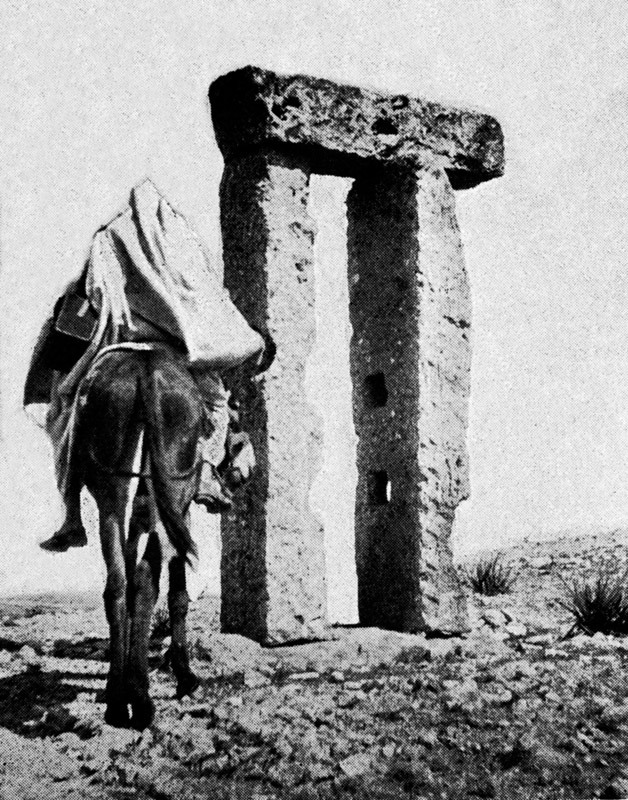 Figures 64-65, from page 226 of H. S. Cowper, The Hill of the Graces: A Record of Investigation among the Trilithons and Megalithic Sites of Tripoli, London, 1897. This is Figure 1, p. 111, from Mavor’s article. 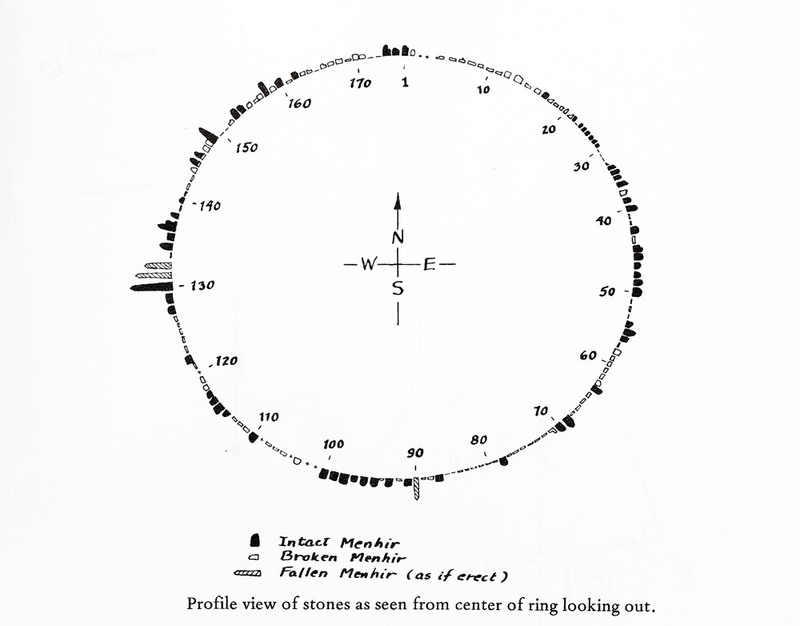 It is Mavor’s survey of the stones of the main megalithic ring of Mezorah. 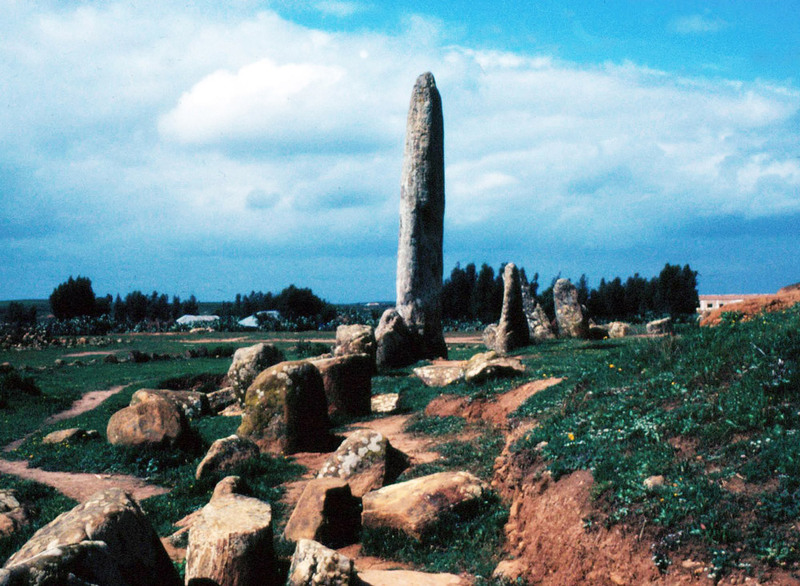 (There are other megalithic configurations at Mezorah beside the main ring, which are not shown here.) 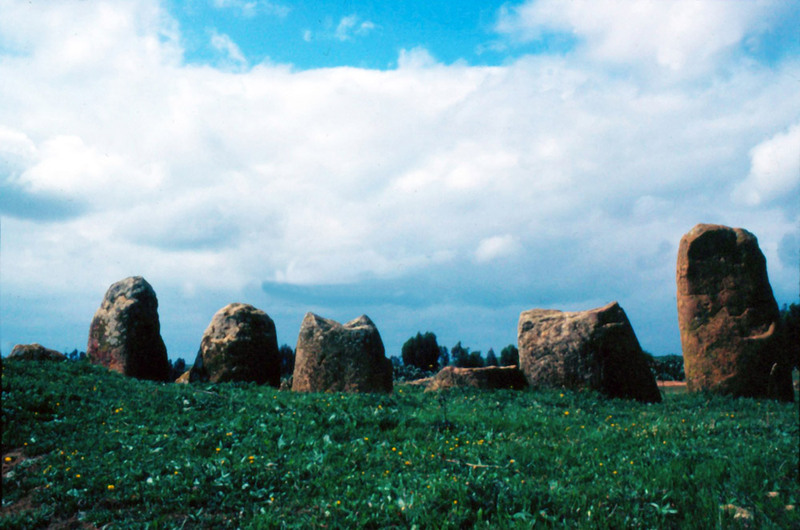 The central mound within the ring is a later addition to the site, long after it ceased to be used for astronomical purposes by the original megalithic builders. The mound was partially excavated by the ancient Romans under Sertorius, and later further excavated 1900 years later by the Spanish archaeologist de Montalban in the 1930s. 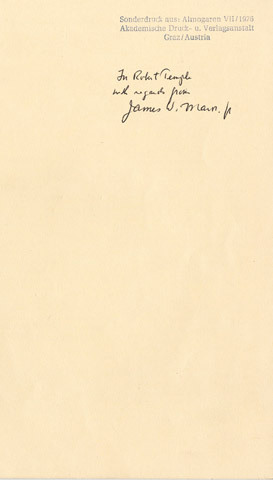 His excavation notes were lost or destroyed when he was politically arrested in connection with the Spanish Civil War. 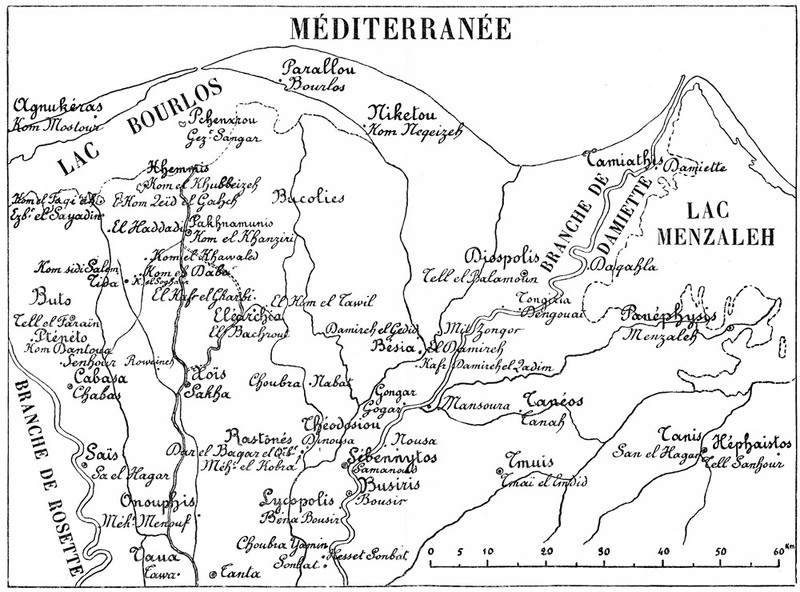 It is ironical that, due to the accidents of history, we know more about what Sertorius found (as recorded by Plutarch) than we do about what de Montalbanm found in the 20th century. This ring appears circular but is in fact an ellipse, the major and minor diameters of which are given. Mavor’s own caption is self-explanatory. 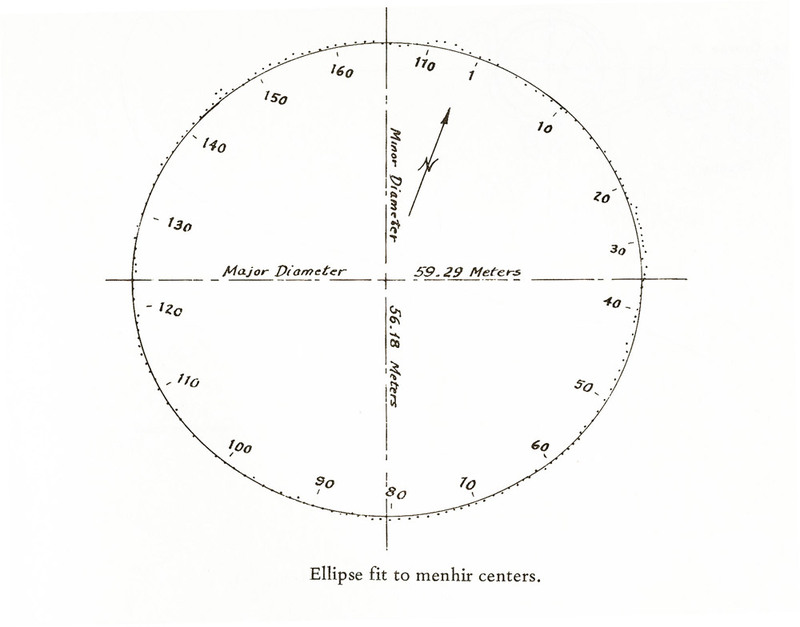 This is Mavor’s Figure 3 from p. 113 of his article. 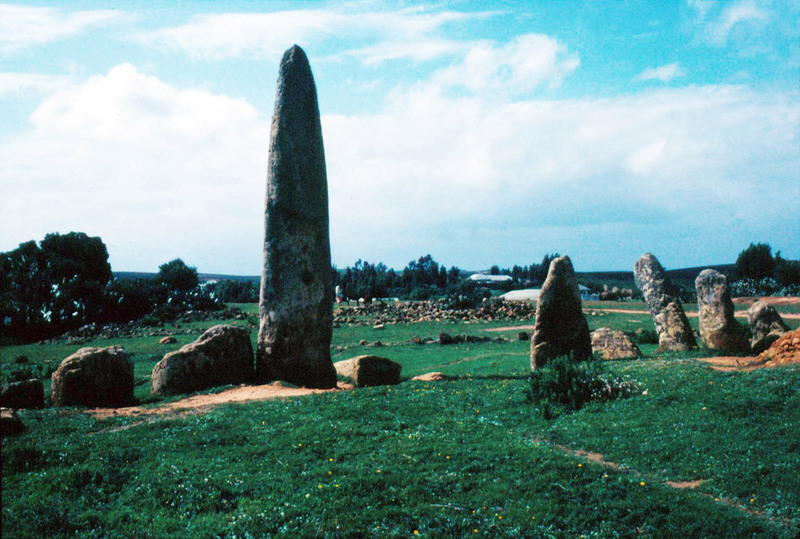 It shows all of the stones as laid flat to indicate their remaining heights (the ones shown as white have been broken like old teeth), and the three which are shaded are fallen menhirs. 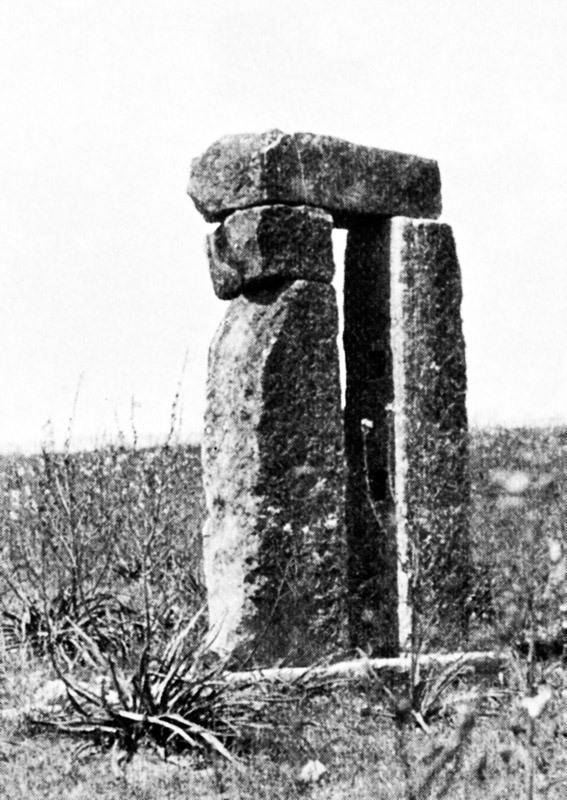 They could easily be raised again if anyone were to take an interest in preserving and maintaining this monument, which is the world’s largest megalithic ring, and should be given world heritage status immediately. 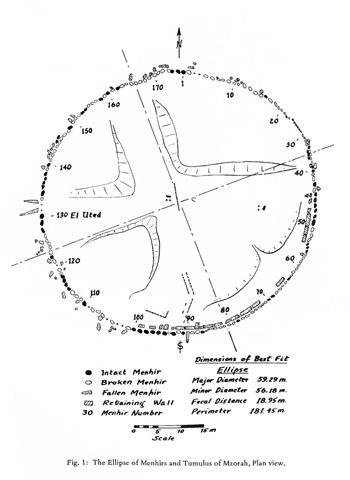 This is Mavor’s Figure 4, from p. 113 of his article. 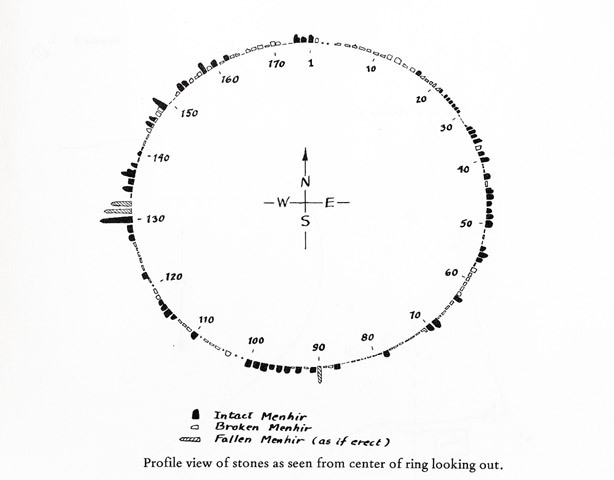 This shows the ellipse superimposed upon the stones of the Ring. 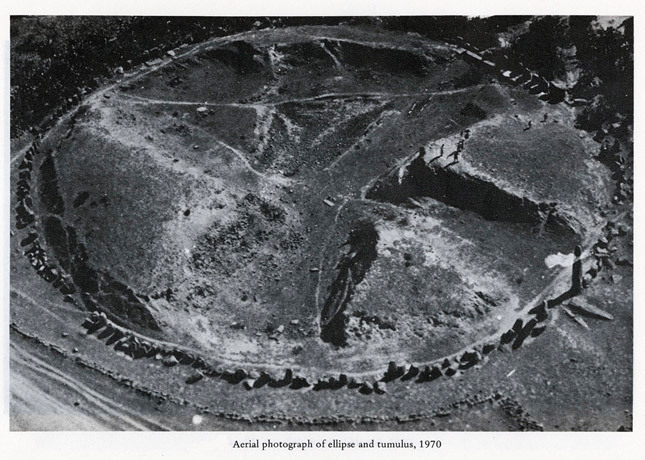 An aerial photo of the Mezorah Ring and its internal (partially excavated) tumulus reproduced by Mavor on p. 117 of his article. This photo was taken in 1970. 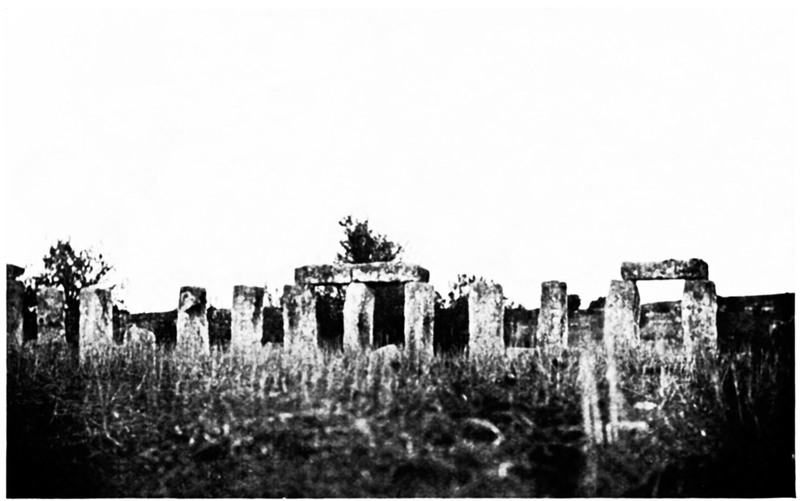 168 of the original stones of the Ring are still in place, though many have been broken off, and a great deal of damage to the Ring has taken place since the 1930s. 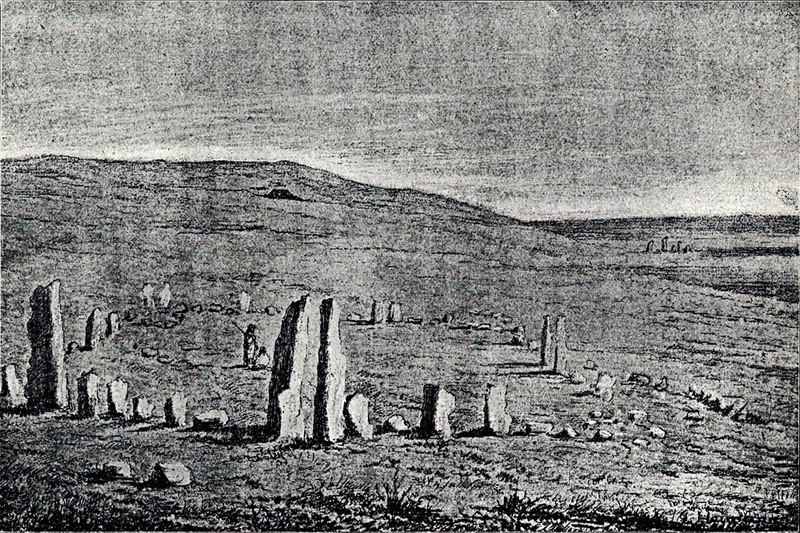 At right, two fallen menhirs can clear be seen lying beside the one menhir which still stands upright in the Ring. 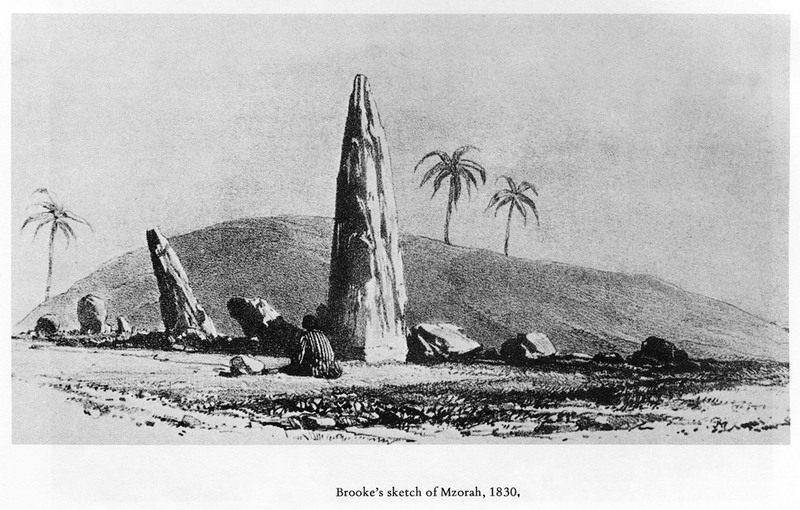 The first ‘modern’ discovery of Mezorah was made by the English traveller Arthur de Capell Brooke in 1830, and he published this sketch of the site in 1831 in his book Sketches in Spain and Morocco, Volume II, London, 1831. 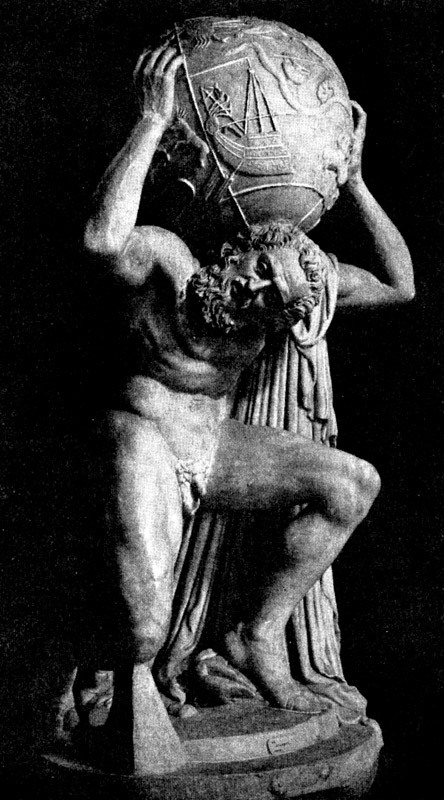 Mavor reproduces it on p. 119 of his article. 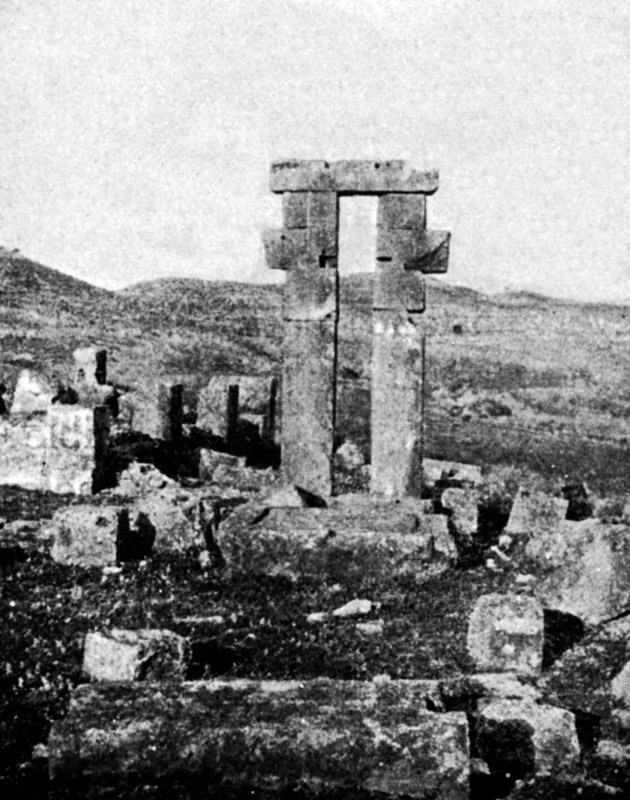 Brooke’s re-discovery of Mezorah was the first time it came to wider notice since it was ‘discovered’ by the Roman General Sertorius, as described by Plutarch in the first century AD. This is the cover of the offprint given to me by James W. Mavor Jr. of his article about Mezorah, which was published in Austria in 1976. 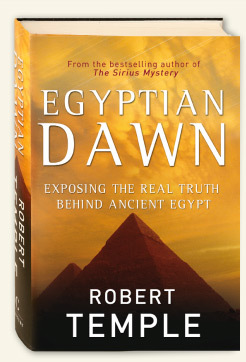 The publication details appear on this cover. 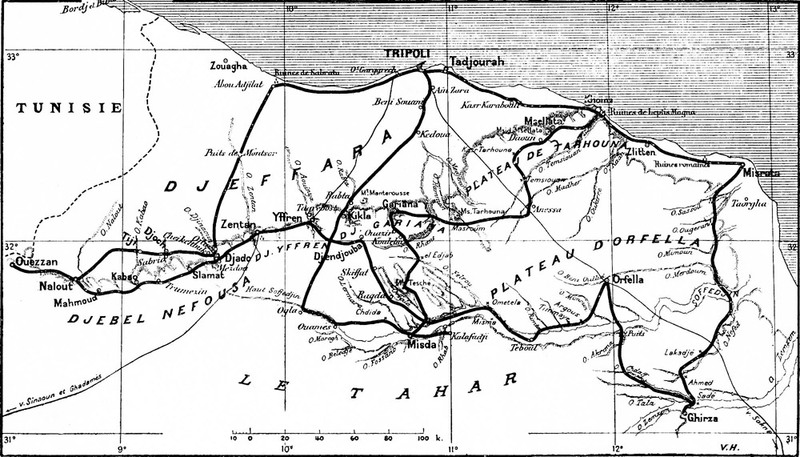 The article, which appears on pages 89-122 with plates, is entitled ‘The Riddle of Mezorah’ and is further described as Contribution from the Woods Hole Oceanographic Institution. Mavor is an oceanographer and worked at that time at Woods Hole, Massachusets, USA, which is one of the world’s leading research centres for oceanographic work. 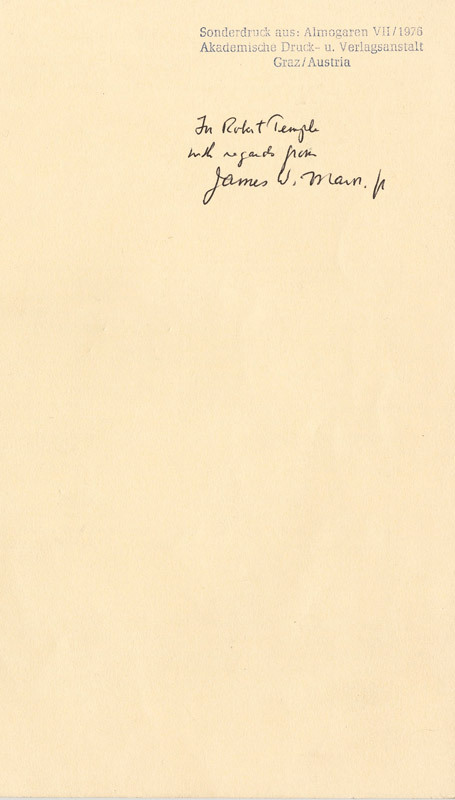 I once visited Woods Hole to have a private meeting with Albert Szent-Gyorgyi, the Nobel laureate who discovered Vitamin C, but at that time I did not know Mavor, and my contact with him was only later on, and took place entirely by post. 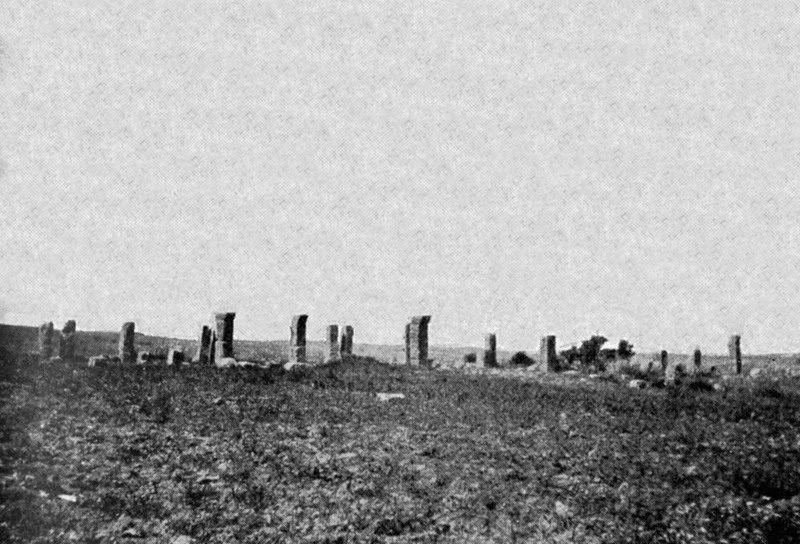 Mavor’s work in surveying the megaliths at the site of Mezorah was undertaken as a private initiative of his, motivated by personal interest and enthusiasm, and its relation to oceanography only concerned the historical coastline issues of the Atlantic Coast of Morroco and not the megaliths themselves. 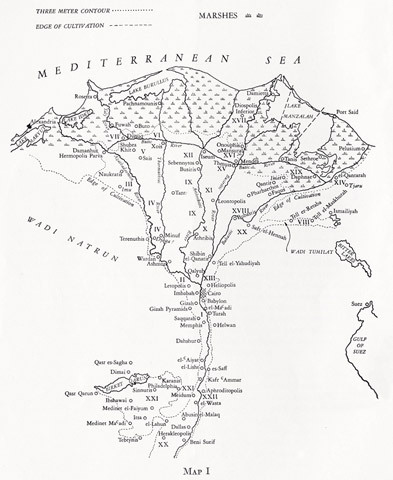 Mavor’s knowledge of the coastline enabled him to work out the river access to the site from the sea in antiquity, an access which is now impassable due to silting over the millennia and changes in sea level.